Frank and Cathy Whittaker are, as far as the outside world can tell, the perfect couple. Young, attractive and well-off, they represent all that middle-class America is supposed to be in the 1950s. Below the surface however, all is not as it seems. Cathy feels unfulfilled and begins to realize that her marriage is not what it should be. When she discovers her husband making love to a man in his office late one evening, she begins to understand why. She also begins to develop an interest in Raymond Deagan, their African-American gardener. Raymond is intelligent, witty and an art lover. In many ways, Cathy has found a soul-mate. Trying to support her husband as he tries to 'cure' his homosexuality and the social taboo of having been seen in public with a black man does not augur well for her however. 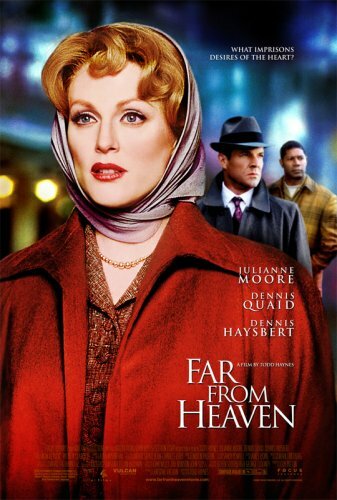 Todd Haynes' Far From Heaven, a homage to the 1950s melodramas of Douglas Sirk, is an exquisitely crafted film of beauty and grace. The world that Haynes creates is so meticulously detailed that one almost forgets that the movie isn't fifty years old.